What’s that sound? In July the birds stop singing and the bugs begin. Some sing during the day, others at night. We usually don’t see what’s making the noise but sometimes we can identify the bugs by song. Here’s a group of insects that are fairly easy to figure out. Cicadas sing during the day and they are loud. Some songs are so unique that you can identify the bug if you know what to listen for. Here are audio descriptions for five common species of annual(*) cicadas in southwestern Pennsylvania in order of “most likely to hear/notice,” at least in my experience. As with birds, pay attention to the habitat where you hear a cicada. Swamp cicadas, for example, are only found in swamps or marshes. Scissor grinder cicada (Neotibicen pruinosus). Easiest sound to identify. Song: a constant burry puttering drone. It doesn’t taper at the end. Dog Day Cicada (Neotibicen canicularis) This is the sound of a hot day in Maine. Where? the most northern species, likes pine trees. 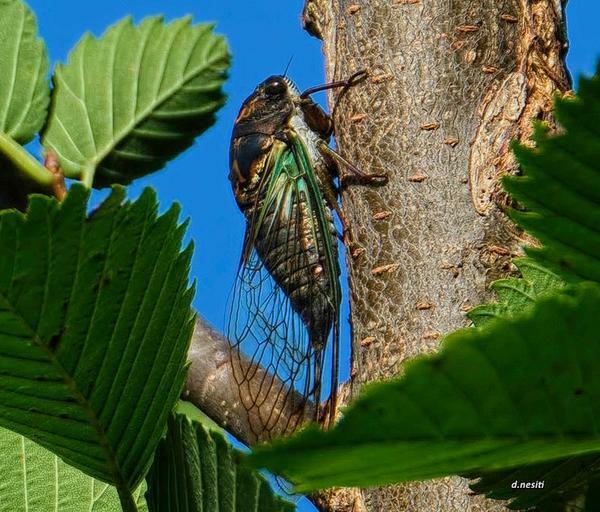 Identifying cicada songs are the tip of the iceberg when it comes to the sounds of bugs. There are an amazing number of vocal bugs including crickets, katydids and grasshoppers. Have you heard a bug you can’t identify? Click here for the Songs of Insects guide to common insect species and their sounds. There are 80 species on this page! p.s. Annual(*) cicadas have a life cycle of 2-5 years but they seem “annual” because some individuals in each species reach adulthood every year (i.e. the species appears annually). p.p.s There aren’t many scissor-grinders in my neighborhood this year. I wonder if they had a bad reproductive year the last time this brood was above ground. How long do scissor-grinders take to reach adulthood? If it’s 5 years then that’d be 2012, a very hot year. Hmmm. There are some scissor-grinders singing here in the Tarentum marina late in the evening. 50 years ago in Lancaster and Reading Pa I heard an abundance of crickets even in small backyards in the citites. I have rarely heard them in Sq.Hill in my yard these past 30 years. The herbicide and pesticide use is probably pretty low in my neighborhood and there are grass, mature trees and shrubs in a good variety. What are your experience and your thoughts about this? Thank for your daily little bits of wonder. I’m not sure about crickets but I know that cicadas live underground for many years. There is so much pavement (and major digging) in the city that there aren’t many places for underground bugs to live quietly emerge. This results in “islands” like Frick and Schenley Parks. No matter where they’re located, island communities are the most vulnerable. I thought I had cicadas but it turned out they are small birdS. There are a pair of them nesting in a small house that I put up last fall. They are flighty and bounce around from the ground to the pine trees and I have not been able to get a good look other than to see that they are a light brown color Anyone know what these are? I live in Southeast Michigan They chatter a lot when I approach the area and sound like cicadas. Sue Daiza, your description sounds like they’re house wrens.